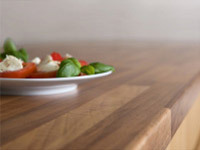 Laminate is still the biggest selling worktop material across the UK kitchen marketplace. 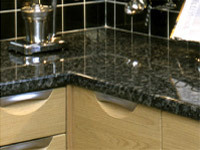 It is available from numerous manufacturers, which means its colour range including gloss-finished worktops is vast. It scores well in comparison to other worktops when you consider how practical it is in general, especially when you take into account that it only costs about £350 to fit into an average size kitchen. 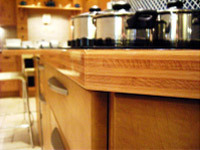 You can now also opt to have laminate upstands and splashbacks in certain colours. However, most clients still seem to prefer selecting a complimentary wall tile. If you’re drawn towards a more vivid blend of different textures and colours in your kitchen, then why not ask your designer to illustrate the effect of adding coloured or frosted glass up stands and splash backs in contrast to your laminate worktop colour. With its new range of 30 to 60mm thick board options, modern post-formed profiled edges and the flexibility to add different edge details such as Wood, Acrylic or Multiplex (which can be curved) laminate is set to continue being a practical, affordable and versatile choice in many of our clients designs.